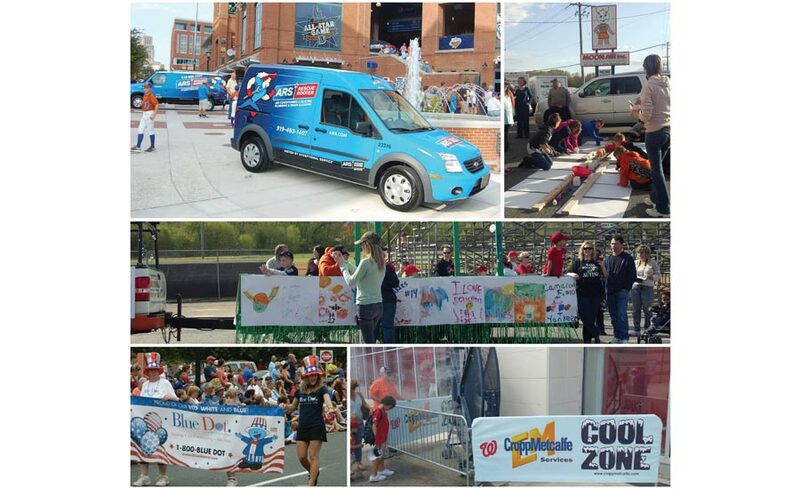 THE HEAT IS ON: While the summer tends to be a busy time for HVAC contractors, many business owners find value in summer marketing plans that include community involvement via parades, sports sponsorships, media partnerships, and more. SPORTS SPONSORSHIPS: CroppMetcalfe, Fairfax, Virginia, has partnered with several professional sports teams in the area and is also heavily involved with local youth athletics. VERY VISIBLE: “The chances of someone booking a service call at a game because they saw our billboard at Nationals Park behind Bryce Harper are pretty slim; however, the more they see our logo, the more familiar they are with us when they do have a service need,” said Eric Tessel, brand manager, CroppMetcalfe, Fairfax, Virginia. UP TO THE CHALLENGE: Moon Air in Elkton, Maryland, built a float for the local special needs Challenger baseball league’s opening day festivities. Sweet, sweet summertime. The heat is in full swing and so are the HVACR trucks and vans. Now’s a good time to spread the word about your company, but what’s the best way to accomplish that? Seasonal marketing offers up an opportunity to increase visibility throughout the community via promotions, sponsorships, special deals, and more. We asked a number of residential and commercial HVACR contractors how they were planning on marketing their businesses during the summer of 2017. Their answers ran the gamut of possibilities. Consumers are much more apt to invest in large purchases, such as new air conditioners, when they feel they’re receiving a great deal. That’s why many residential contractors offer exclusive sales and promotions during the summer. These offers help get contractors in the door and tend to increase the likelihood of a sale. Additionally, exclusive summer promotions and deals boost company visibility when community members are most active. According to Vimala Ingram, communications director, American Residential Services (ARS), headquartered in Memphis, Tennessee, summertime allows the company to offer deals that remind customers to service their a/c units to ensure they are running properly throughout the hot season. Summer promotions may make a desirable service more affordable, which helps to attract customers willing to purchase solely on price. Technicians tend to be quite busy in the peak summer months as they are dispatched to an ongoing stream of service calls. Despite the full schedule, some contractors tend to push their limits in hopes of growing the company when the going is good. “We’re focused on growth this summer,” said Steve Moon, president, Moon Air Inc., Elkton, Maryland. “Right now, we are waiving the response fee for a customer if they complete a repair. This has been a big hit for us, and people seem to be receptive to this idea. Also, we’re offering ‘Saturday Service Same Price.’ We have limited appointments in the summer, but customers can book a Saturday service for no overtime charge. While summer is a time when technicians tend to shine, raking in tons of service opportunities, some companies, such as CroppMetcalfe, spend the summer months focusing on its other departments. Every company is different. Some go all out when it comes to summer advertising while others hold back because they can’t meet the existing demand. Regardless, most owners will continue to market their companies to some degree in June, July, and August, but where exactly is the focus? Many contractors target online advertising, because it is malleable and easy to change. “Online pay-per-click is a major driver of our summer leads,” Ingram said. “If online is paired with some broadcast media, it makes for a very successful integrated marketing campaign. It’s important to have multiple touch points throughout the customer journey. Online advertising can be adjusted in real time while direct mail requires a longer lead time and becomes a sunk cost after it’s printed and distributed,” said Ingram. Moon recognizes that his customer demographic doesn’t have a huge online presence; therefore, this summer, he’s investing in other media and expects a sizable return on investment. Some HVAC companies tend to scale back on advertising during the summer because there isn’t a need to do so. It’s hot, people need air conditioning, and technicians are booked as a result. Ingram identified June and July as peak season for ARS’s HVAC service centers. In contrast, ColonialWebb, a Comfort Systems USA company and commercial (B2B) mechanical contractor, focuses its summer advertising budget on recruiting rather than promotions or sales. Summertime is a busy time for young families. Little league games dominate parks, parades stomp through the streets, and communities are connecting via various social events. Many HVAC companies have identified these events as marketing goldmines and pledge their marketing monies accordingly. For Moon Air, the summer season is packed full of opportunities to give back while gaining community awareness. In addition, Moon Air supports many other community organizations and institutions, such as the Union Hospital Breast Health Center in Elkton, Maryland. Each summer, Moon participates in the Pink Ribbon Race, a grand prix race throughout downtown Elkton. All the proceeds are donated to the hospital’s new cancer center. Many local children have grown fond of Moon Air’s mascot, the Moonman. Moon’s daughter often dresses up in the costume and, along with a “circus of inflatables,” visits children’s birthday parties. In lieu of his previous success, Moon is determined to accelerate his marketing even further this summer. Summer parades are a summertime tradition and favorite for community members and service companies. Moon likes to take the opportunity to get involved in many different parades. If he’s not sponsoring a little league float, he’s decorating a vehicle to ride in the parade, complete with the Moonman, of course. Many companies have found success expanding their brand awareness by sponsoring a summer sports team. For CroppMetcalfe, giving back to the community by getting involved with local sports teams is a huge part of its summer marketing initiative and overall success as a company. “We’ve partnered with several professional sports teams in the area, and we are also heavily involved with local youth athletics, as well,” Tessel said. “In our area, sports transcend demographics, as everyone has a favorite team and/or a child involved in athletics. “The main summer team we sponsor would probably be the Washington Nationals,” Tessel continued. “We’ve been with them for about six years total, and while our marketing program includes stadium signage and digital media, the most valuable perk may be the large ticket bank we get to use throughout the year. We use the tickets to reward coworkers, as giveaways for customers, and for other promotions during the year. American Residential Services Columbia in South Carolina believes sports team sponsorships are part of the company’s core values. They have found the sponsorship to be a great way to remind hot baseball fans about air conditioners when they advertise with the Columbia Fireflies baseball team. “Sports sponsorships encapsulate one of our three pillars for community outreach,” said Ingram. “One example is our sponsorship of the Columbia Fireflies. Due to the team’s association with Tim Tebow, who is also a celebrity endorser of ARS’s corporate headquarters, ARS Columbia partnered up to fund the sponsorship. Sports, in general, have a universal appeal. It’s smart to associate the local ARS service center with a local team or organization that has a loyal fan following. In addition, ARS utilizes its mascot, “Dandy,” who Ingram said represents ARS’s team of front-line superheroes. Whether you’re zipping into your company mascot suit for the local Fourth of July parade or offering up an irresistible summer promotion, you may want to consider all the various marketing prospects available before the sun sets and October arrives. This summer is sure to be a busy one, and opportunities to advertise your HVAC services are around every corner.